Large fully assembled chest of drawers with luxe gold frame and clear glass mirrored panels. Perfect for vintage inspired bedroom with gold bar style handles. 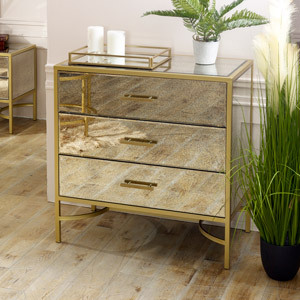 The Venus Range offers a luxurious and glam look with this chest making ideal clothing storage for the bedroom or a luxe look to a living room or hallway. Matching furniture also available. Three drawers offering plenty of storage for clothes, complete with metal runners for easy operation. Large fully assembled chest of drawers with luxe gold frame and clear glass mirrored panels. Perfect for vintage inspired bedroom with gold bar style handles. 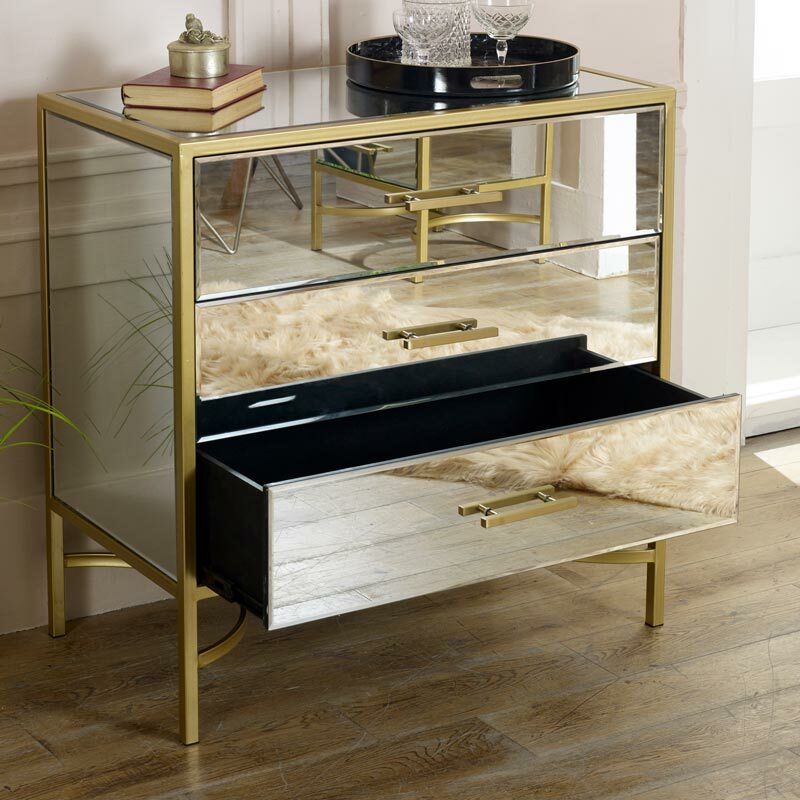 The Venus Range offers a luxurious and glam look with this chest making ideal clothing storage for the bedroom or a luxe look to a living room or hallway. Matching furniture also available. Three drawers offering plenty of storage for clothes, complete with metal runners for easy operation. Constructed with gold painted metal frame and clear glass panels. The chest of drawers comes fully assembled and ready for use. The drawer measure 72.5cm x 17cm x 38.5cm (width x height x depth). We have a fantastic selection of furniture for the home. With standalone pieces to full furniture ranges in a great choice of styles, colours and finishes. No, the Venus Range comes fully assembled. 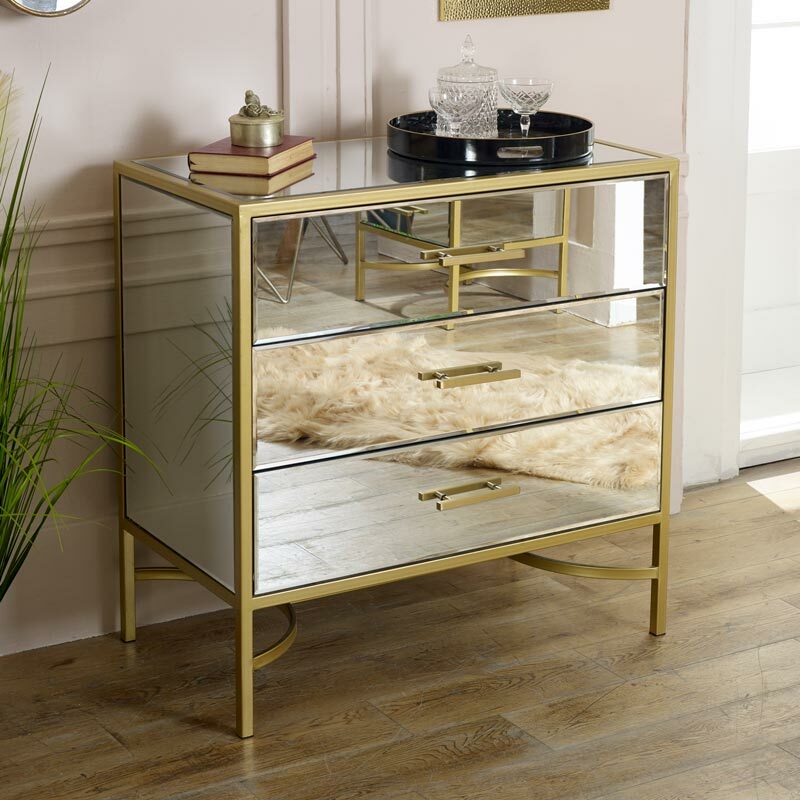 The frame is in a gold finish with clear glass mirrored surfaces. The frame is made from metal and the mirrored panels from glass. We have a small selection of furniture in the Venus Range, includes console table and bedside / side table. Delivery is with our furniture courier and takes 2-12 days depending on the location, we do offer a quicker delivery service, please contact us for further details.